This sentence spoken by the Rev. Martin Luther King Jr. has been quoted countless times as expressing one of America's bedrock values, its language almost sounding like a constitutional amendment on equality. Yet today, 50 years after King shared this vision during his most famous speech, there is considerable disagreement over what it means. The quote is used to support opposing views on politics, affirmative action and programs intended to help the disadvantaged. Just as the words of the nation's founders are parsed for modern meanings on guns and abortion, so are King's words used in debates over the proper place of race in America. As we mark the King holiday, what might he ask of us in a time when both the president and a disproportionate number of people in poverty are black? Would King have wanted us to completely ignore race in a "color-blind" society? To consider race as one of many factors about a person? And how do we discern character? For at least two of King's children, the future envisioned by the father has yet to arrive. "I don't think we can ignore race," says Martin Luther King III. "What my father is asking is to create the climate where every American can realize his or her dreams," he says. "Now what does that mean when you have 50 million people living in poverty?" "When he talked about the beloved community, he talked about everyone bringing their gifts, their talents, their cultural experiences," she says. "We live in a society where we may have differences, of course, but we learn to celebrate these differences." The meaning of King's monumental quote is more complex today than in 1963 because "the unconscious signals have changed," says the historian Taylor Branch, author of the acclaimed trilogy "America in the King Years." Fifty years ago, bigotry was widely accepted. Today, Branch says, even though prejudice is widely denounced, many people unconsciously pre-judge others. "Unfortunately race in American history has been one area in which Americans kid themselves and pretend to be fair-minded when they really are not," says Branch, whose new book is "The King Years: Historic Moments in the Civil Rights Movement." Branch believes that today, King would ask people of all backgrounds - not just whites - to deepen their patriotism by leaving their comfort zones, reaching across barriers and learning about different people. "To remember that we all have to stretch ourselves to build the ties that bind a democracy, which really is the source of our strength," Branch says. Bernice King says her father is asking us "to get to a place - we're obviously not there - but to get to a place where the first thing that we utilize as a measurement is not someone's external designation, but it really is trying to look beyond that into the substance of a person in making certain decisions, to rid ourselves of those kinds of prejudices and biases that we often bring to decisions that we make." That takes a lot of "psychological work," she says, adding, "He's really challenging us." 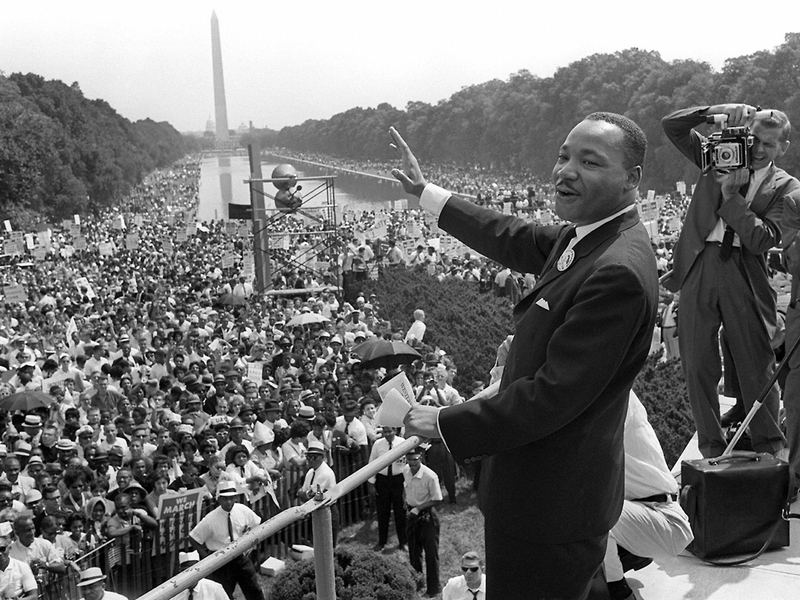 For many conservatives, the modern meaning of King's quote is clear: Special consideration for one racial or ethnic group is a violation of the dream. "The Declaration of Independence says all men are created equal," Clegg says. "Nobody thinks it doesn't really mean what it says because Thomas Jefferson owned slaves. King gave a brilliant and moving quotation, and I think it says we should not be treating people differently on the basis of skin color." Many others agree. King's quote has become a staple of conservative belief that "judged by the color of their skin" includes things such as unique appeals to certain voter groups, reserving government contracts for Hispanic-owned businesses, seeking more non-white corporate executives, or admitting black students to college with lower test scores. In the latest issue of the Weekly Standard magazine, the quote appears in the lead of a book review titled "The Price Was High: Affirmative Action and the Betrayal of a Colorblind Society." Considering race as a factor in affirmative action keeps the wounds of slavery and Jim Crow "sore and festering. It encourages beneficiaries to rely on ethnicity rather than self-improvement to get ahead," wrote the author, George Leef. Last week, the RightWingNews.com blog included "The idea that everyone should be judged by the content of their character, not the color of their skin" in a list of "25 People, Places and Things Liberals Love to Hate." "Conservatives feel they have embraced that quote completely. They are the embodiment of that quote but get no credit for doing it," says the author of the article, John Hawkins. "Liberals like the idea of the quote because it's the most famous thing Martin Luther King said, but they left the principles behind the quote behind a long time ago." In October, after black actress Stacey Dash was attacked for switching her support from President Barack Obama to Mitt Romney, she said she chose Romney "not by the color of his skin but the content of his character." Clegg acknowledges that it can be difficult today for some people to resist jumping to conclusions based on skin color. He says past discrimination resulted in fewer opportunities for African-Americans, which increased poverty, unemployment, and other social pathologies in the black community. "Then white people say, what did we tell you, that's the way these people are," Clegg says. "It's wrong, people shouldn't do it, but it's going to happen." Yet as we discipline ourselves not to pre-judge African-Americans, Clegg says, we cannot forget that King asked us to judge character. That means taking actions such as reducing the high rate of black children born to unmarried parents and placing more value on education, he says. "I don't think King would neglect the `content of their character' side today," he says. "You have to break the vicious cycle from both ends. People have to do their best not to use stereotypes, but at the same time, people have to not live up to them." Some doubt we will ever be able to ignore what a person looks like. "To ignore color is to ignore reality," says Lewis Baldwin, an Alabama native who marched in the civil rights movement and now teaches courses on King at Vanderbilt University. "Dr. King understood that we all see we are different. You accept color differences, affirm them, celebrate them, but don't allow them to become a barrier to human community," said Baldwin, author of a new King book, "In A Single Garment of Destiny: A Global Vision of Justice." Yet Martin Luther King III believes that one day we will be able to live every word of his father's dream. "I think my father's vision was that we should at some point have a colorblind society," he says. "He always was challenging us to be the best nation we could be."